When the first “Avengers” film hit theaters in 2012, select movie theater chains ran a 6-movie marathon showcasing the previous five Marvel movies and finishing it off with the new release. Now with the second “Avengers” film approaching, theaters are preparing to run another marathon, this time playing all 11 Marvel movies in an approximately 27-hour time period. 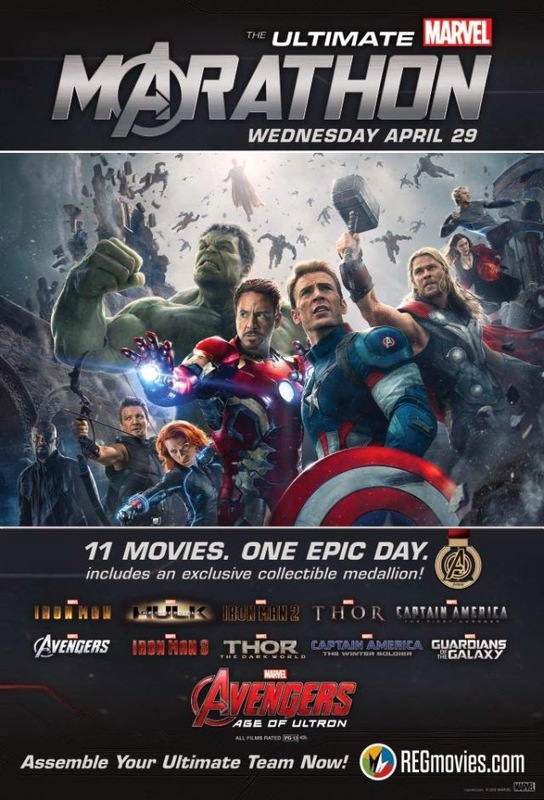 The Marvel Ultimate Movie Marathon will take place on April 29 at select AMC and Regal theaters across the country, including the AMC Downtown Disney 12 in Anaheim, Cali. and the AMC Downtown Disney 24 in Orlando, Fla. Currently, only select theaters will be hosting the ultimate marathon, but more details will be announced as the date approaches. Visit AMC’s and Regal’s websites for details. At $70 per ticket, the event averages to less than $6.50 per movie. 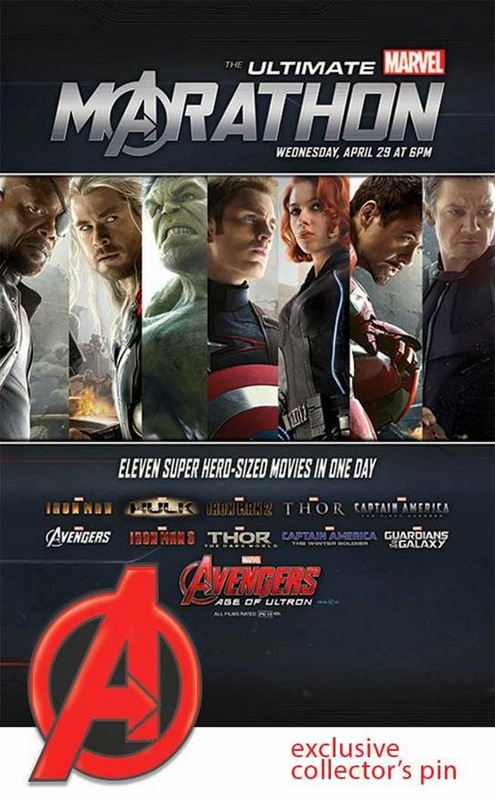 Included in the purchase of each Marvel Ultimate Movie Marathon ticket is a collectable Avengers medallion that will be distributed at the end of the final movie. AMC is also offering a collector’s pin to ticket holders and those who are members of their AMC Stubs rewards program will receive $10 in Bonus Bucks to spend at the concession stand during that event. As with other movie marathons, there will be breaks in between for snacks and bathroom breaks. Of course, if you’re just looking to see the new film, tickets are already on sale for “Avengers: Age of Ultron” in its regular format, 3D, and IMAX 3D where available. While the official release date is May 1, some theaters like AMC offer shows starting the day before as early as 7pm. You can visit their website to find your local theater. The Walt Disney Company purchased Marvel Entertainment in late 2009 and has played a big role in the films’ distribution, marketing, and merchandising. You can currently find Marvel products in your local Disney Store or online at DisneyStore.com. 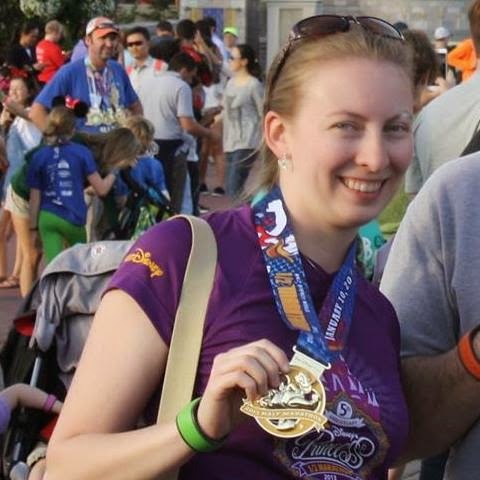 The franchise was also incorporated onto Disney Cruise Line ships and into the runDisney program in 2014. With a third version of the “Avengers: Age of Ultron” trailer recently released, Disney fans and Marvel fans alike are anxiously awaiting their chance to assemble for this year’s film.